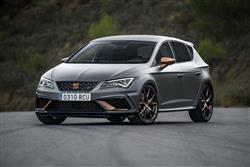 SEAT doesn't bestow Cupra R status lightly and the 310PS Leon Cupra R is a suitably heavyweight contender in the hot hatch class. The good looks of the standard Leon are enhanced by the usual potent looks, befitting the Spanish brand's most powerful and exclusive model to date. There are certain badges with the power to send hot hatchback fans weak at the knees. Ford has RS, Volkswagen has GTI, Honda has Type-R, Renault has Renaultsport and there are others but the branding that SEAT reserves for its most explosive machinery might be slightly less familiar. 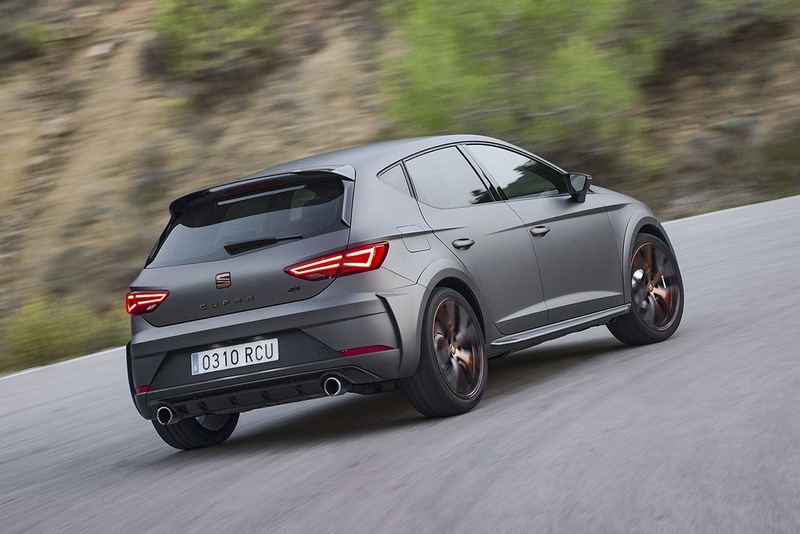 SEAT's Cupra R insignia isn't used often and lacks the longstanding heritage of some but when it does appear on the rear end of a Spanish hatchback, you can bet fireworks are in store. 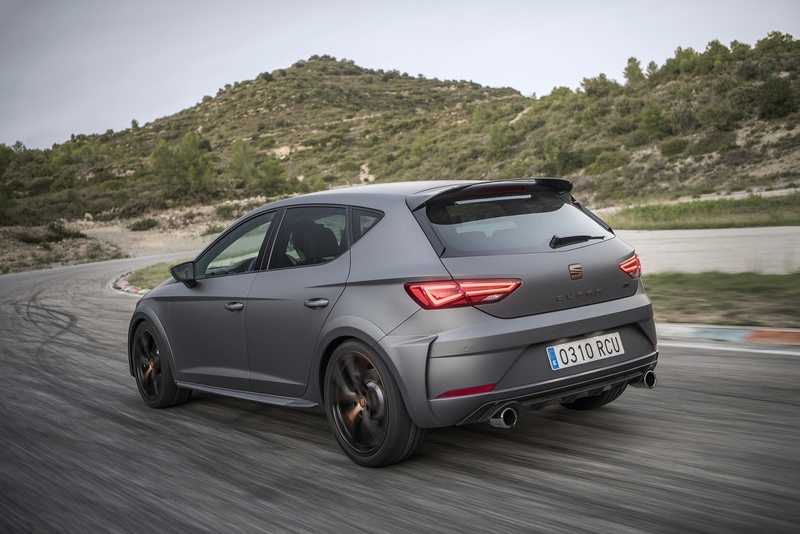 It certainly pays to stand well back when the touch paper is lit on the latest Leon Cupra R. The problem has been making a Cupra R that was thrilling enough. With 180PS 1.8 TSI 'FR' models selling like hot cakes and 300PS 'Cupra' hot hatch models already available in the Leon range, any top 'Cupra R' derivative would have to be properly powerful. Eventually, the engine was found for the job and following a lengthy break since the Cupra R badge last appeared on a Leon, this successor model was unveiled. The 2.0-litre petrol engine that powers the Leon Cupra R has become ubiquitous in fast hatchbacks from SEAT and other Volkswagen Group marques. It's an excellent powerplant that's ideally suited to the task of making a compact car feel muscular and exhilarating. 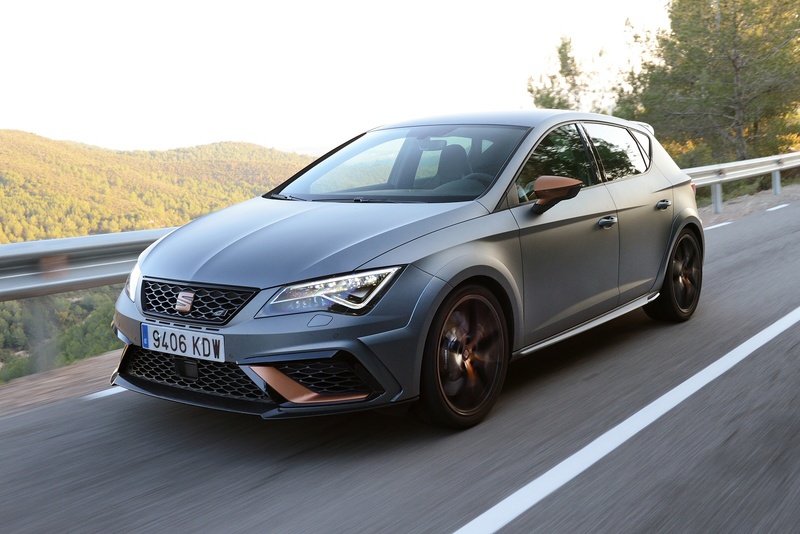 The Cupra version of the Leon already uses this smooth turbocharged unit and with that variant packing a hefty 300PS, this range-topping model needed a fearsome amount of clout to justify its 'R' extension. Adjustments to the engine management system, increased turbo boost pressure and an upgraded fuel injection pump elevate the Leon Cupra R to a 310PS maximum power output. It's only available mated to a 6-speed manual gearbox. The engine has the power to put the Cupra R up alongside the top performance hatchbacks. It's broadly the same as that found in the Volkswagen Golf R and the Audi S3, giving the Leon a 0-62mph time of 5.8s and a top speed artificially limited to 155mph but unlike these contemporaries, it lacks all-wheel-drive. The suspension features aluminium components which reduce unsprung weight and improve the ride quality. 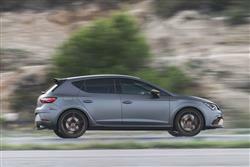 It helps make this fiery Leon a surprisingly comfortable car for everyday driving while still retaining the firmness and rigid body control that a top tier hot hatch needs. In its Leon family hatchback, SEAT has an excellent starting point from which to fashion a stunning-looking hot hatchback. The swooping lines of the basic Leon are amongst the most adventurous in the family hatch sector and show little sign of aging. The aesthetics have been given even greater impact in 'R' form, through carbon fibre details for the rear spoiler, lower lip spoiler, side skirts and rear diffuser. The newly extended wheel arches and the front also benefit from a more powerful design around the air intakes. Copper colouring is also a key theme and comes into play on the door mirrors, CUPRA tailgate lettering, and copper and black 19-inch CUPRA R alloy wheels. Inevitably, as the flagship of the Leon CUPRA range, the R also ushers in an upgraded interior. The copper treatment continues on the inside, with the hue being carried through to the detailing on the dashboard, centre console, door panel stitching and steering wheel CUPRA logo. Rounding off the sport-oriented look and feel is Alcantara for the gearstick, steering wheel and front bucket seats with copper stitching. Underlining exclusivity, each car will also feature a numbered plaque. There aren't many family hatchbacks which are available in three different guises that could realistically be termed hot but the SEAT Leon is one. 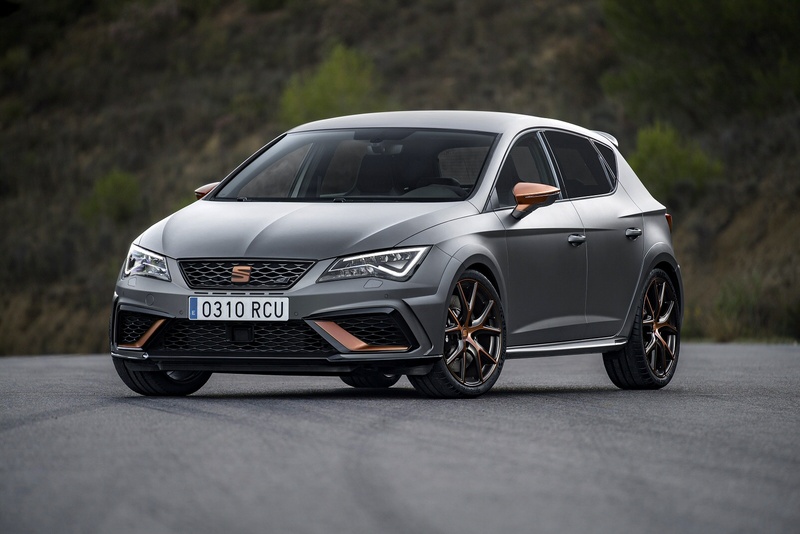 From the 180PS 'FR' model, there's an £8,000 step to the 'Cupra 300' but a 'Cupra R' will set buyers back a further £4,500, costing around £35,000. The pricing isn't cheap but this is the ultimate Leon and it comes suitably well-equipped. Over the Leon 'Cupra 300', the flagship variant receives a 'KESSY' pack (Keyless Enter & Go with Wireless Phone Charger), a 'Winter Pack' (heated front seats and headlight washers), a rear view camera, a 'Safety Pack' (Tiredness recognition System and rear seatbelt reminder), a thumping 'BeatsAudio' sound system with 10 speakers, adaptive cruise control and lastly, the 'Navigation System High' pack (eight-inch touchscreen, Full Link, dynamic route guidance with 3D map display and 3D emblematic buildings, 10GB hard disk drive). Two metallic paint options are available, 'Monsoon Grey' and 'Midnight Black', both of which are included in the car's price. This 2.0-litre turbocharged engine tends to do a good job of keeping running costs manageable wherever it crops up. For a car with the Cupra R's level of performance, the efficiency figures are pretty good. Expect these to be little different from those of an ordinary 'Cupra 300' variant (47.9mpg on the combined cycle and 158g/km of CO2). Otherwise, it's as you'd expect. The warranty is the usual Volkswagen Group three year or 60,000 mile affair, which is about the minimum manufacturers can get away with these days. Service intervals are every 20,000 miles. Do get an insurance quote before you commit to buy as premiums will vary widely. If you�re looking for a new SEAT Leon 2.0 TSI Cupra R 310 5dr Petrol Hatchback for sale, you�ve come to the right place. At Bristol Street Motors we don�t just have the best SEAT Leon 2.0 TSI Cupra R 310 5dr Petrol Hatchback deals, we also offer friendly advice and help with all your enquiries to ensure your buying experience is a happy experience.